I have fallen deliciously into some kind of frenzy of making winter warmers. I love handmade crafts because they can bend and flex to create a whole range of goodies. Here it is all about winter goodies! On this page is a collection of various neck warmers (for want of a better generic term) including Neck Wraps, Neck Shawls, Neck Tubes ((my favourite! 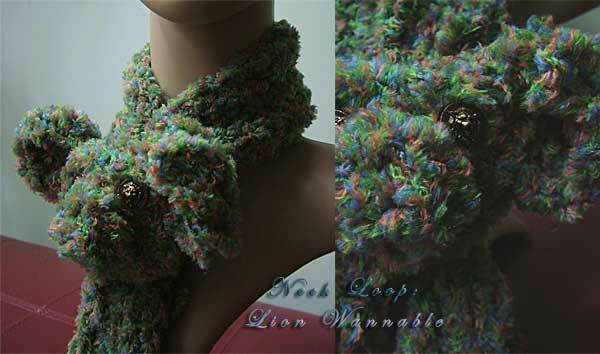 ), and Character Neck Loops. I call the following "neck loop" as they have an integrated loop through which the other end easily loops through. Neck loops can normally be worn at different lengths for varying style as well as to adjust the level of hot-ness! 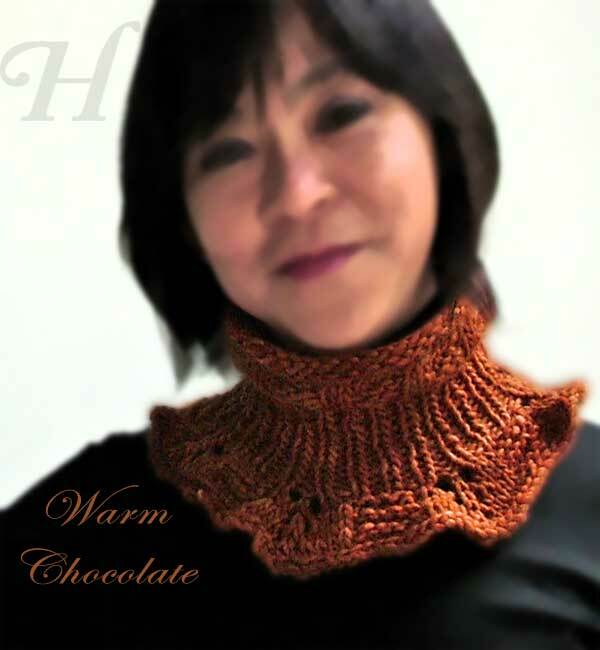 This neck loop has lots of warm character. Lion Wannabe neck look features a little cuddly who wants to be a big, bold lion. So as you will see, the lion shines out of his eyes! 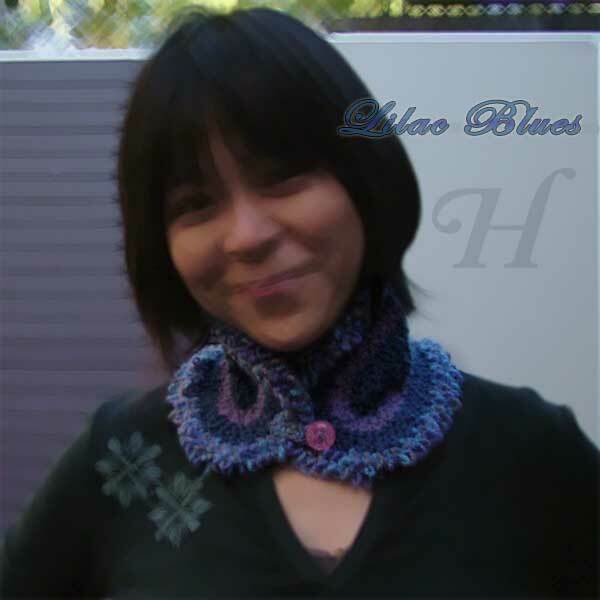 Neck loops are extremely easy to wear - just wrap around the neck and loop through! You can wear the neck loop short and tucked snugly against the neck for extra warmth or on less chilly days, you can wear it longer. This is the Lion Wannabe with lions shinning out of his hopeful eyes. This neck loop is non-itchy and very soft. 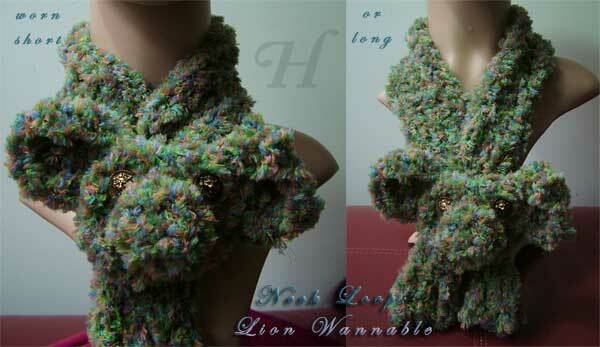 It is made entirely with finger knitting. 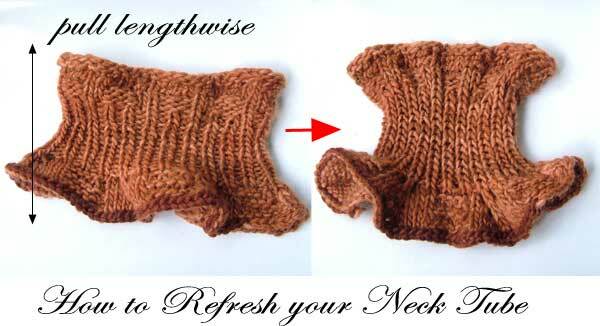 Please read Care/Maintenance of handmade neck warmers. 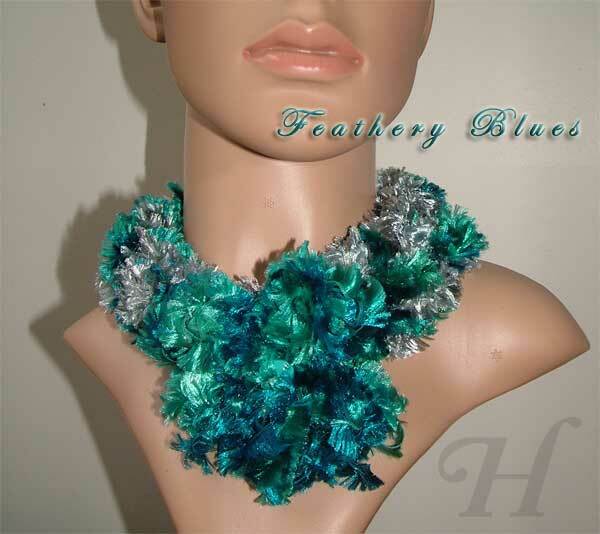 Feathery Blues neck loop is soft & elegant with a snug, nice fit around the neck. The large flower can be worn either slightly at the side or at the front. 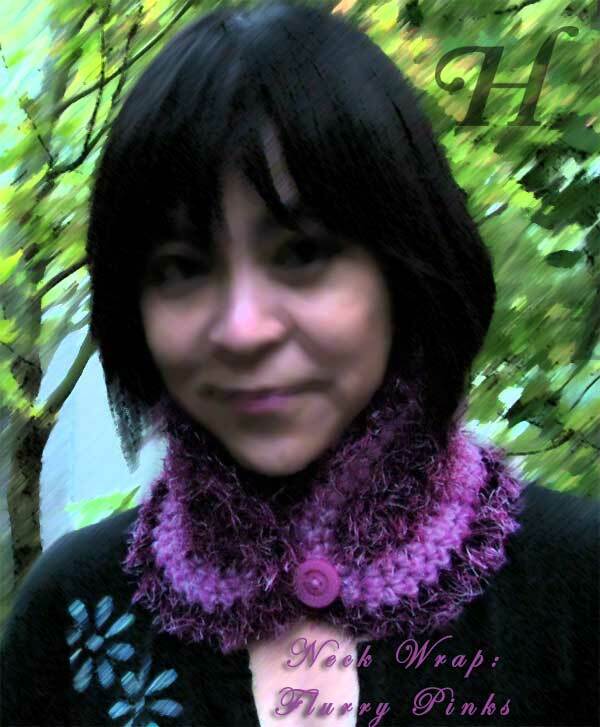 Neck loops are extremely easy to wear - just wrap around the neck and loop through! For this, the flower end is looped through the hole at the other end. 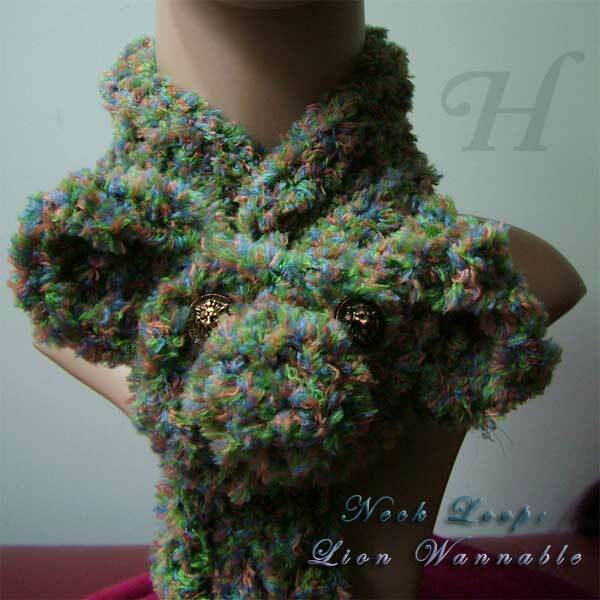 How To Make Neck Loop: This has been done in finger knitting. 3 longs strands of finger knitted. 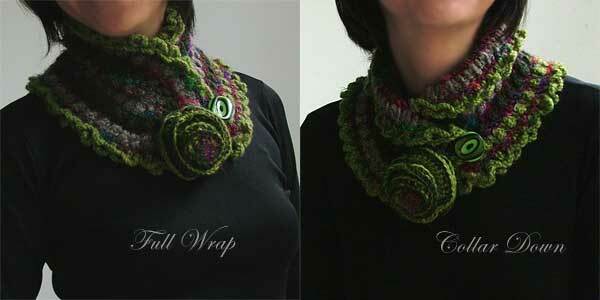 Each Length: when folded in half, it should be much more than around the neck circumference. Attach the 3 knitted strands together at one end and braid. Crochet chain the braided length, making sure there is a hole at one end. Hole is about 1.5 inches long. Make another longish finger knitted strand. Gather at intervals to make flower. Sew on at end opposite loop/hole. 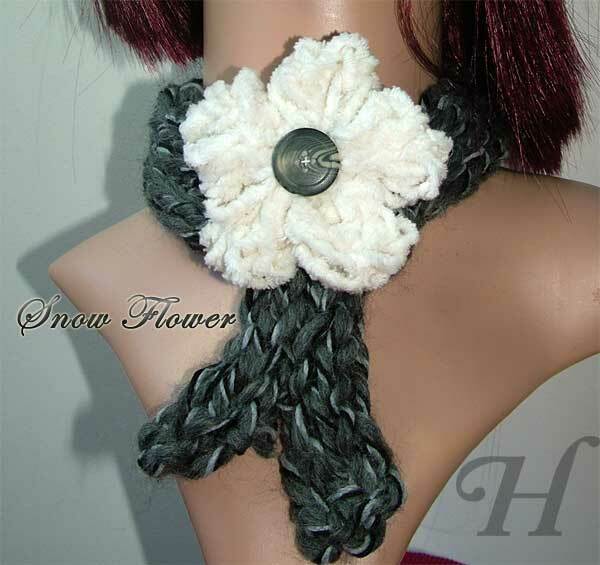 Snow Flower neck loop is for the chic and elegant. Both the neck loop and the flower are done in finger knitting. Make a finger knitted length (here in gray) that when doubled over, is slightly more than sits comfortably around the neck. When done, fold the finger knitted strand in half, sew together leaving a small loop (about 2 cm) at the folded end. Make the flower with finger knitting as well. After making the flower shape, sew on the button. The flower is attached to the loop in the neck look. I call this a "neck shawl" though I know that is not quite the proper term. 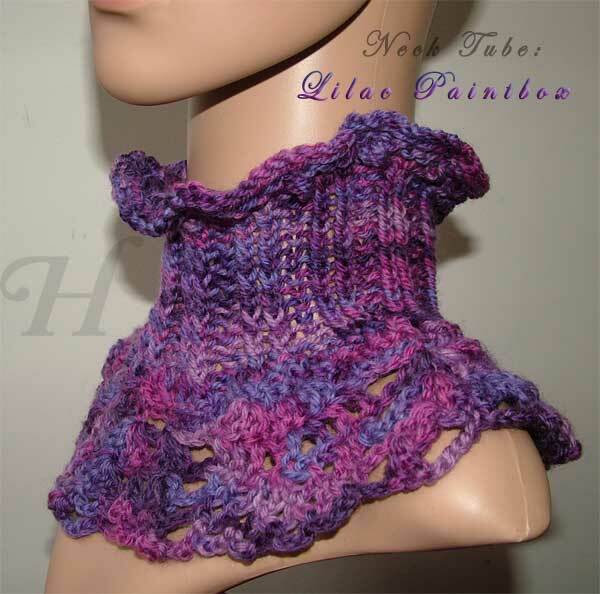 But not knowing what or if there is a proper term, I think neck shawl is pretty explanatory. Can be worn with 'collar' up or down. For style and for warmth regulation! I must confess that though I like the result, I did not enjoy the making of this as I normally do with handmade crafts. Something about the pattern stitches or maybe I was not fully in the mood. Despite that, I am please with the softness of this neck shawl: it's simplicity of use and its ability to give the wearer a collar-up or collar-down look. 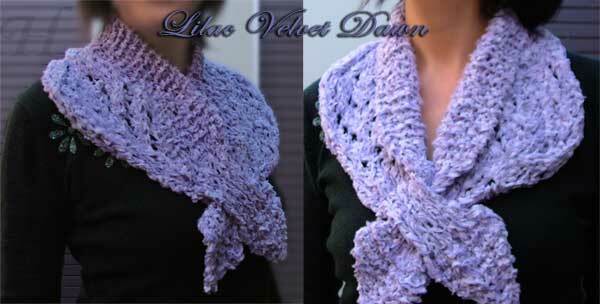 Makes this neck warmer/neck shawl suitable for a larger range of weather conditions. 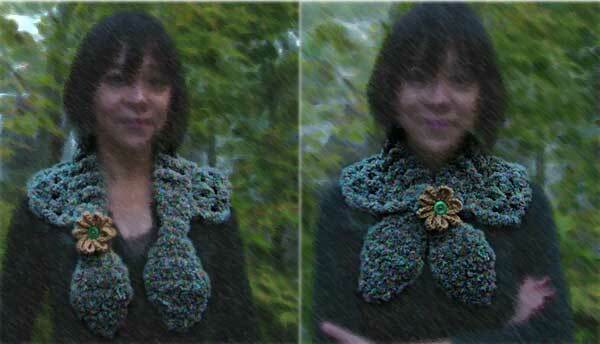 This photo gives a better idea of the layout/design/shape of the neck shawl. The 'loop through' hole is done in rib: first the front (keep on needles), then the rib back of the same length. Pick up all stitches (one from front, one from back) on the same needle and continue with the piece to make the 'leaf shape' ends. 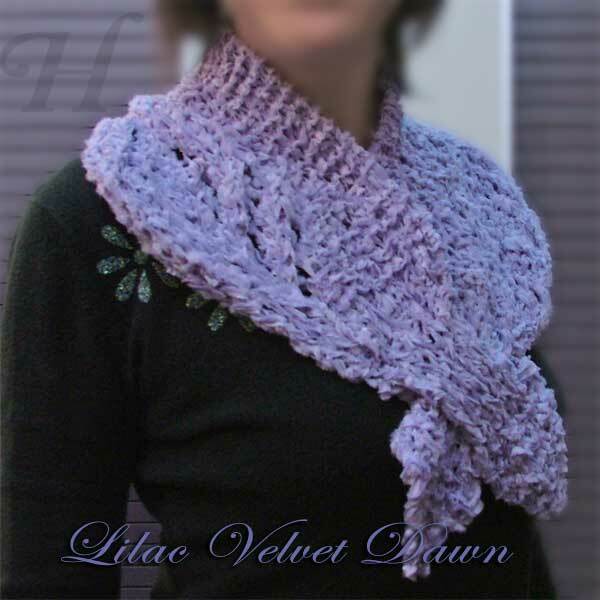 This neck shawl is a great match to the fingerless gloves Velvet Lilac (if still available). 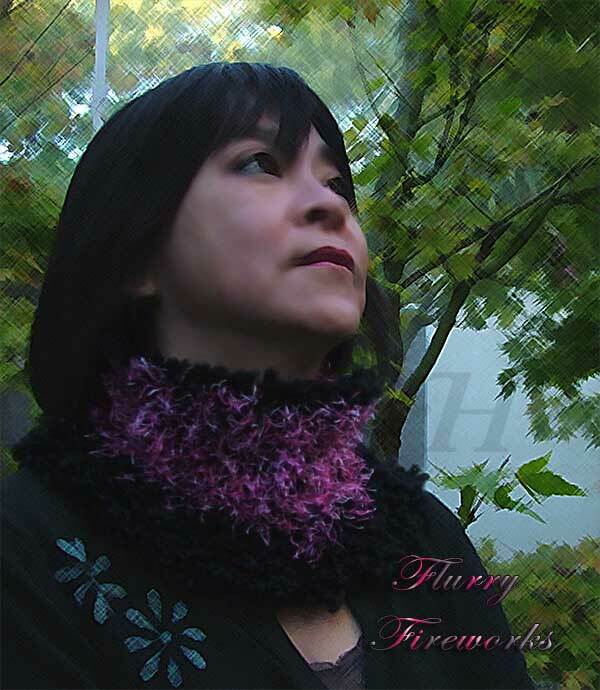 This Neck Shawl is made is extra full & furry yarn. It is therefore extra cozy! Easy to wear - just pull one end through the integrated hole (double layer) on the other side. I don't know if there is already a term for these neck warmers, but since making them, I call them "neck tubes", that being the most descriptive term I can think of. And let me say right now - THESE ARE MY FAVOURITE-EST kinds of neck warmers. In fact, since my first beta one, I wear them not just all through the day, but also to bed!!! easy to wear. No, make that very easy to wear. practical - must not have things getting in my way as I work. Must take the absolute minimal time for me to put on. I also discovered another wonderful thing about neck tubes. 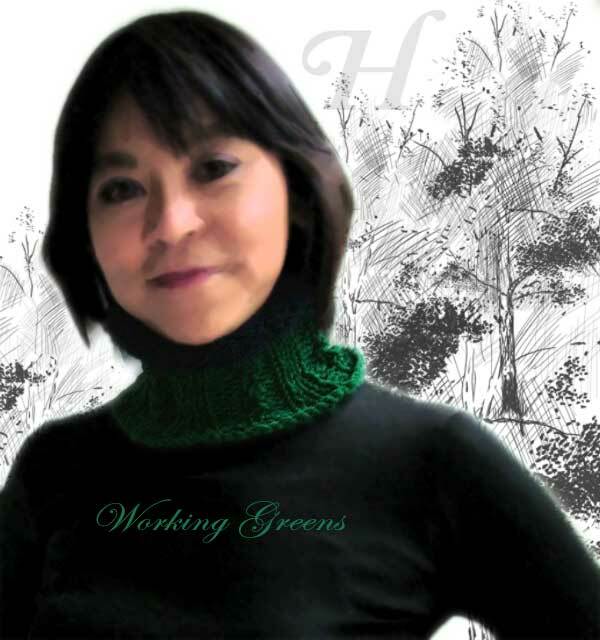 Because they are knitted in rib stitch (in the main), they can be easily refreshed back into perfect shape! You wear neck tubes by simply pulling it over your head. So with wear, they can become stretched and "fat". By simply pulling length wise (see photo above), they come back easily to shape. 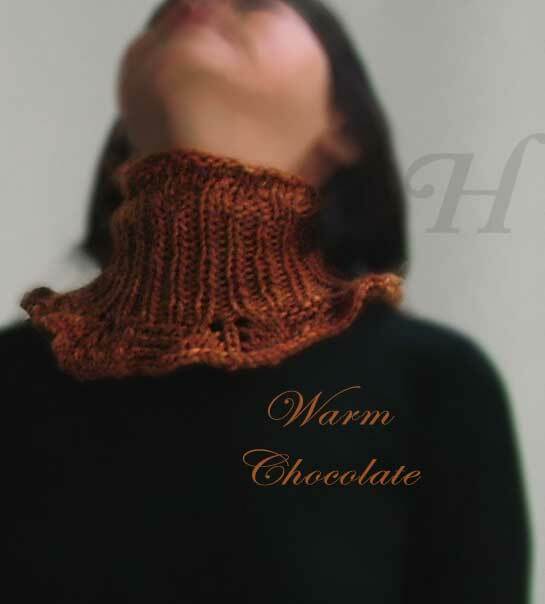 Warm Chocolate Neck Tube was my very first trial creation and what I ended up with met my hopes and expectations ... and more! I wear it every chilly day, all day .. and night!!! And I wear it while working without having buttons to do or dangling bits that keep getting in my way. 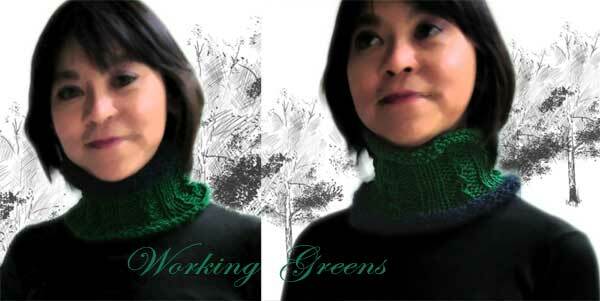 Neck tubes are super, super easy to wear - pull it on, just like a pullover, but cuter!! This is knitted in a rib stitch (though I think in future, a double rib might be better) for a snug, cozy fit. I worked this downwards (according to the pic). The first 2 rows are garter stitches and I ended up with a bit of a fancy frill at the end. The entire piece is worked in the round (so no seams to mar it later on). I love this, my first neck tube so much - I am keeping it!!! 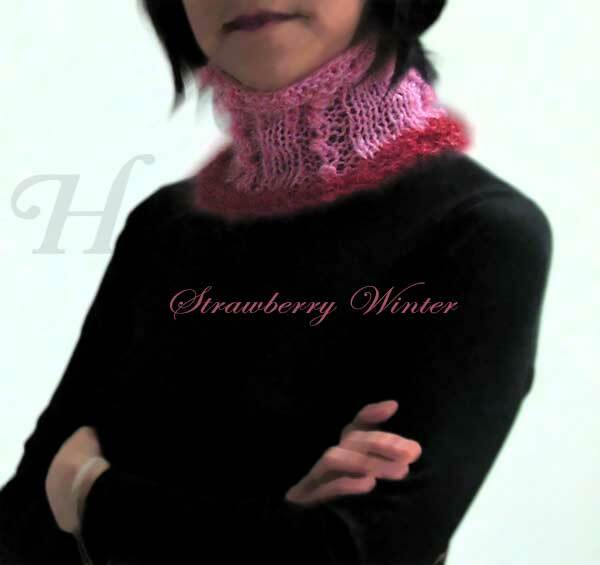 Strawberry Winter neck tube is made in a mohair blend wool. It is an easy, comfy fit. 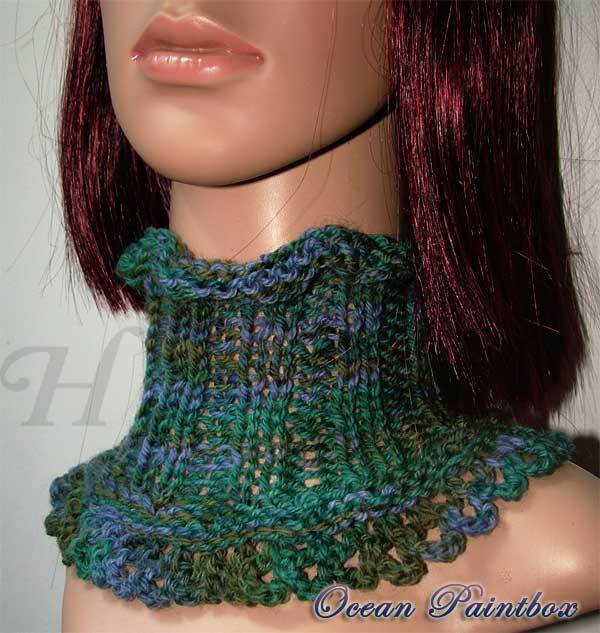 This neck tube can be worn with the contrast edging at the top or bottom - to match your mood, style, and attire. 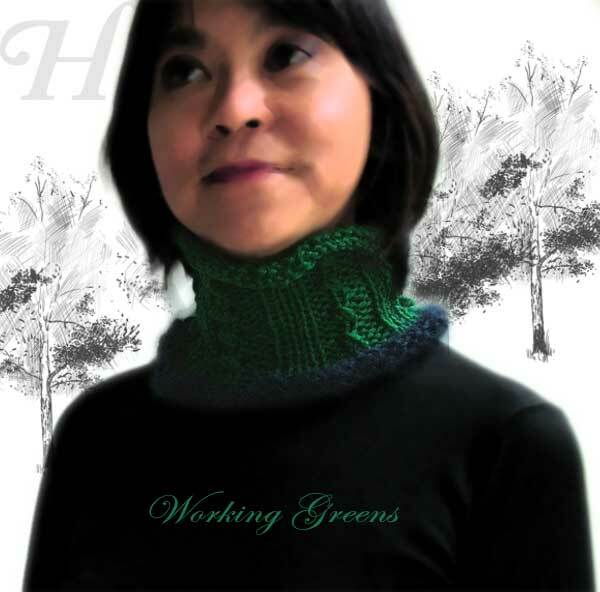 Working Greens neck tube is made in 100% wool and edged with Mohair yarn. It is an easy, comfy fit. 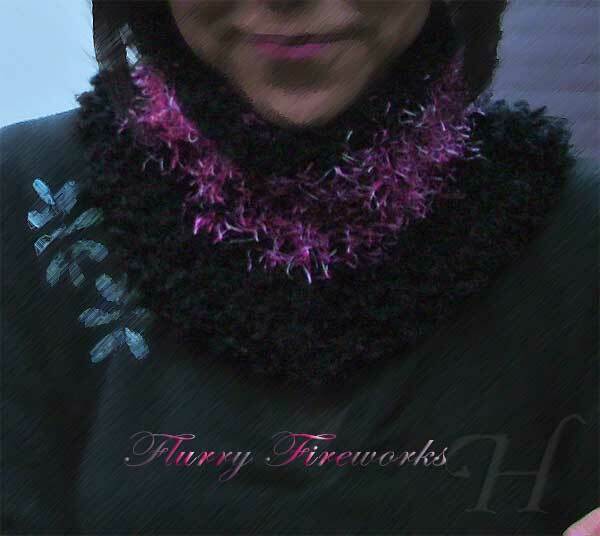 Flurry Fireworks is truly cuddly and cozy. 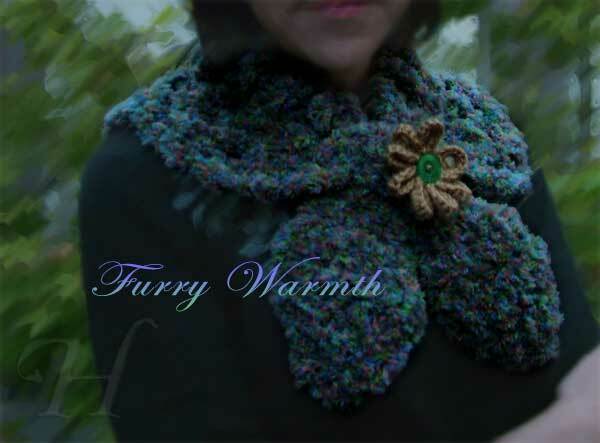 Made in soft fluffy furry yarn, it cuddles you while keeping you warm. 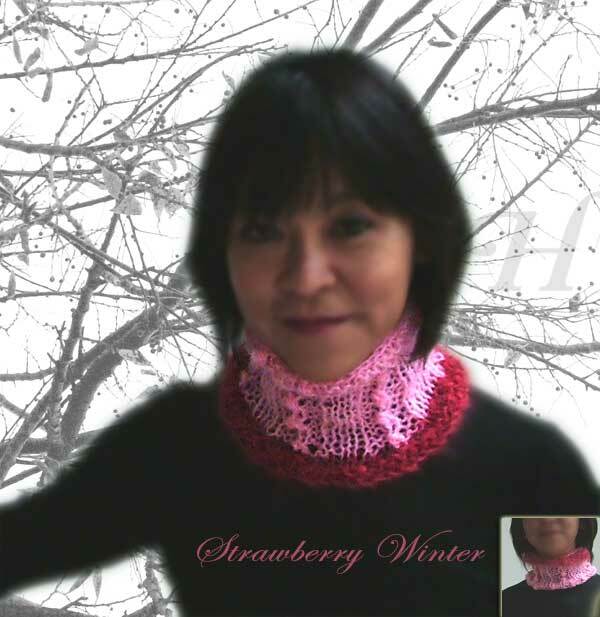 Super easy-to-wear neck tubes - pull on for toasty warmth, keep that naughty chill from your vital neck area. 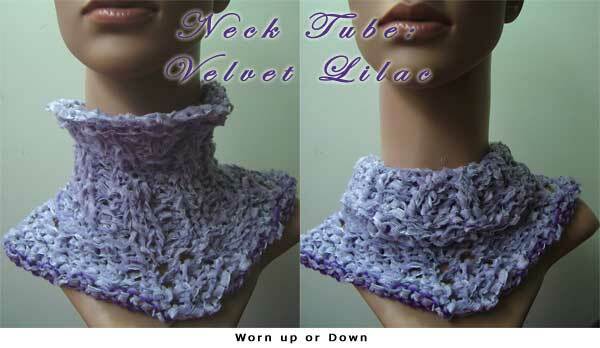 Velvet Lilac neck tube is a perfect companion to the Velvet Lilac Fingerless gloves. This neck tube can be worn up or down, to suit the day's temperature and your style! 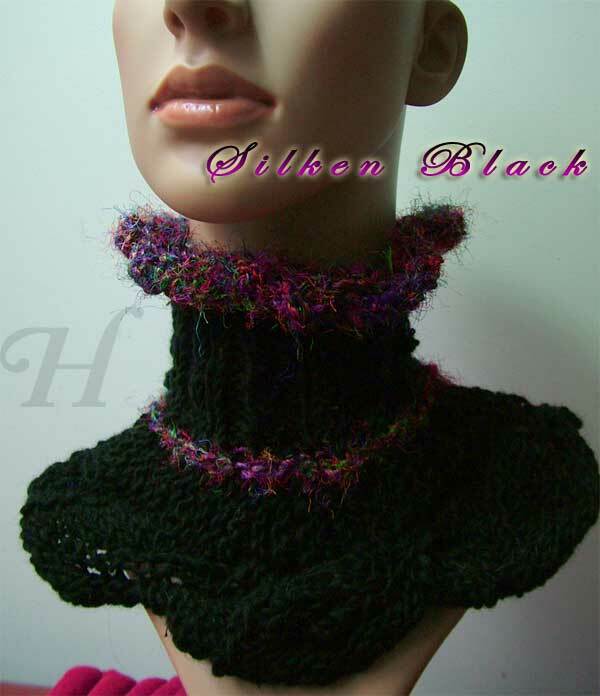 Silken Black neck tube is made both for warmth & elegance. It is made entirely out of pure wool and silk - both from the hills of Nepal. 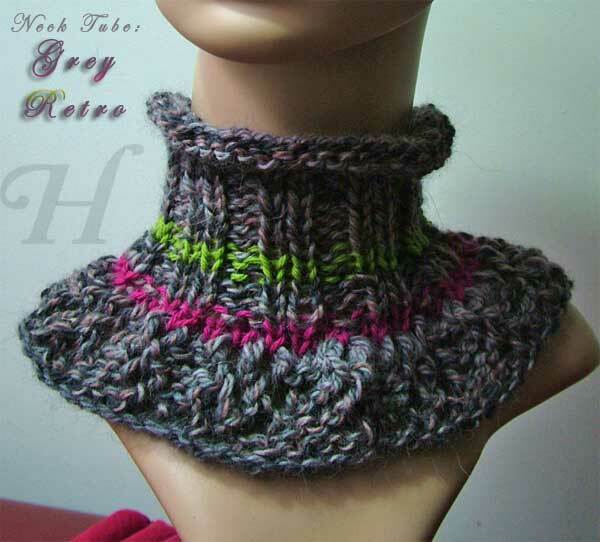 On a cold winter's day when all may seem dark and a bit gloomy, and you are in a somber mood, this Grey Retro neck tube with its touch of uplifting retro colors will lift your spirits while keeping you cozily warm. 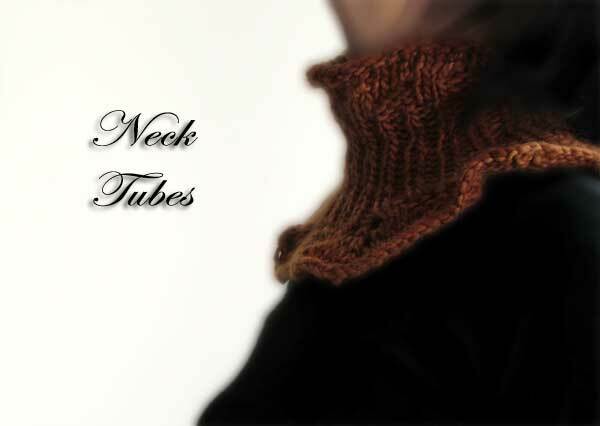 A very soft and cozy neck tube for all work and play occasions. Lilac Paintbox neck tube is 100% pure new wool and I think the variegated colors are just Delicious! So delicious that I have made a couple of fingerless gloves to match this. 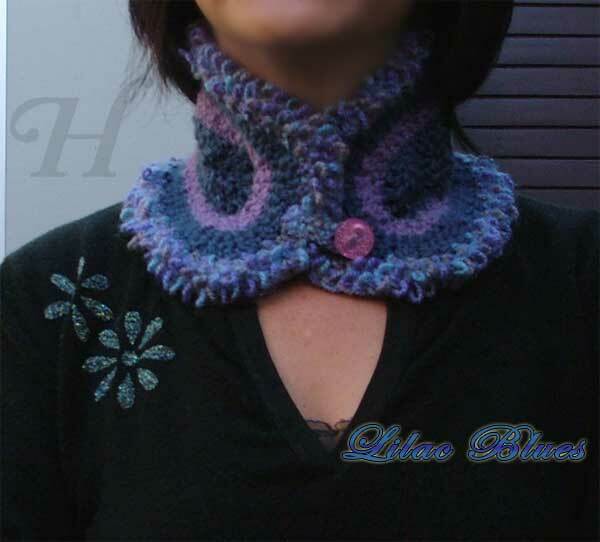 This neck tube is done in crochet and knitting. Worked from bottom up; worked in rounds (no seams) all the way. The bottom section (lacy part) is done in crochet. Then stitches are picked up all round. Stocking or garter stitch for 1-2 rows, rapid decreasing till there are about 40-44 stitches. Then double rib knit all the way to the top. Important: There must be a few rows at the top (stocking, reverse stocking, or garter stitch) whereby you increase number of stitches so that the tube will fit comfortable over the head. 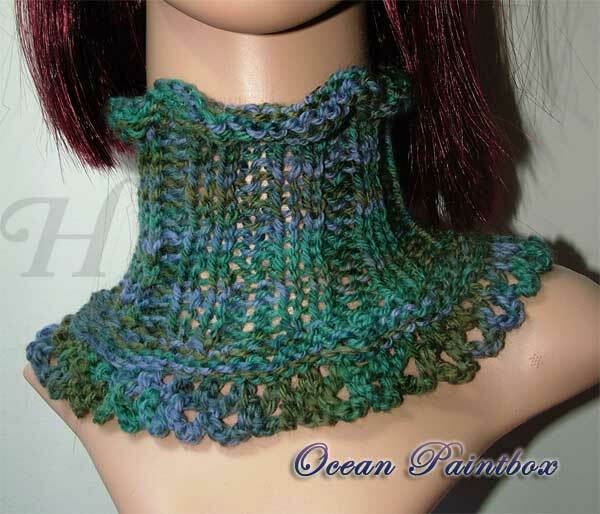 Ocean Paintbox neck tube is 100% pure new wool and I think these variegated colors are just Delicious as well! Coz I love neck tubes so much, I made them for a friend (Melly) coz I think she will love them too. They are so hassle free and comfortable - it is just super ideal for a busy girl. 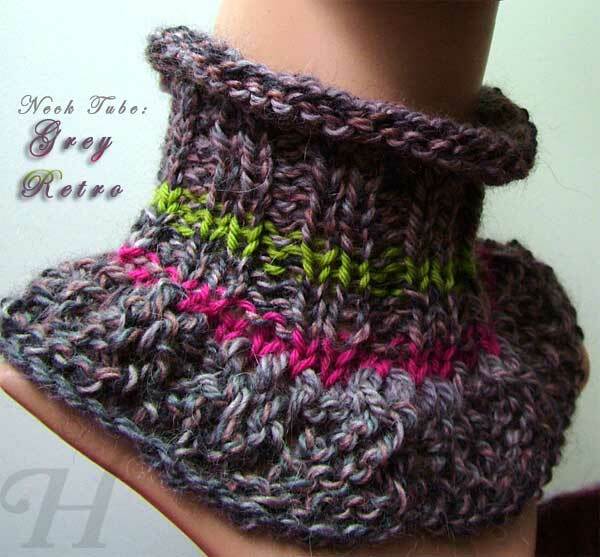 This neck tube matches the Lilac Greens fingerless gloves which Melly has bought. Then stitches are picked up all round. Stocking or garter stitch for 1-2 rows, rapid decreasing till there are about 40 stitches. I call the following "neck wraps" or "necklets". Yet again, I am searching for correct terms but perhaps there is no one correct term as such. I particularly like the term "neck wraps" because they seem so appropriately descriptive. This neck wrap is cozy and warm. By using solid colors, I find that you can easily bring out (and make dominant) corresponding colors within a variegated color yarn. 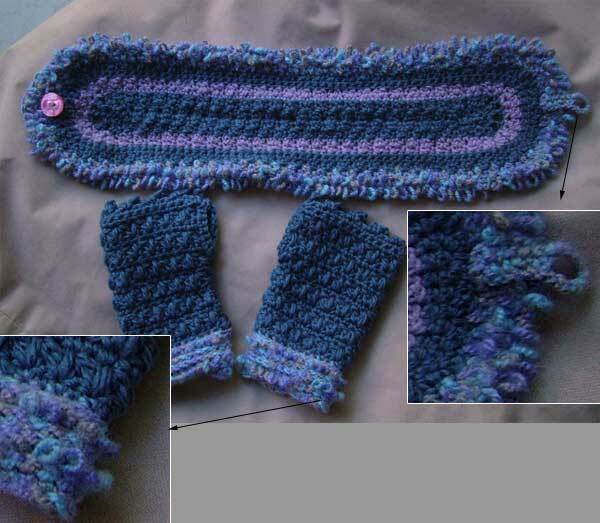 Here I chose blues and lilac to bring out the corresponding colors in the variegated yarn. 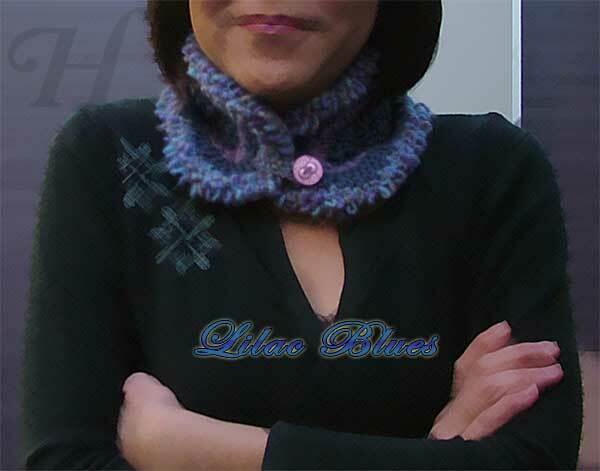 Neck warmers are extremely easy to wear - just wrap around the neck and button up! The loop is done via finger-crochet cording and then sewn on. 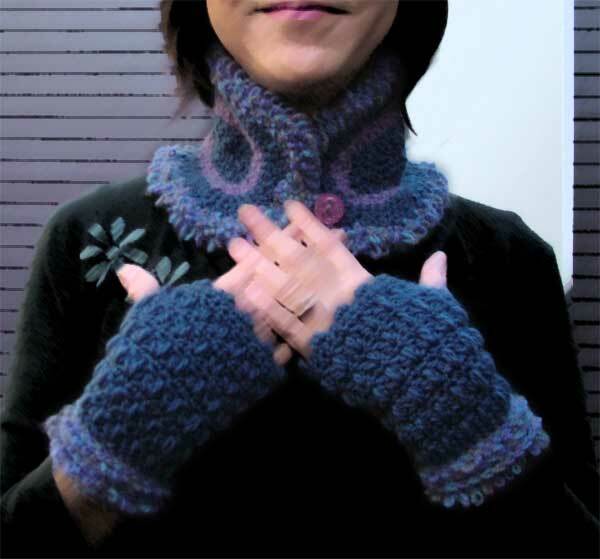 This pic here shows a pair of matching fingerless gloves (CH0263p) that go so well with the neck wrap. Here you can see the neck wrap and the fingerless gloves laid out with some detailed sections. The fluffy bits is done via crocheting with loops. 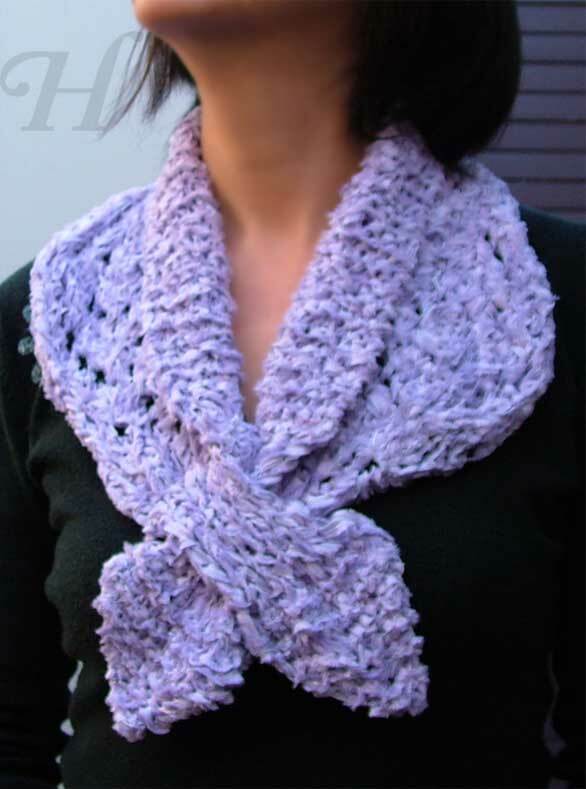 This neck wrap (neck warmer) is perfect for wintry autumn days and to take the edge of any biting cold. 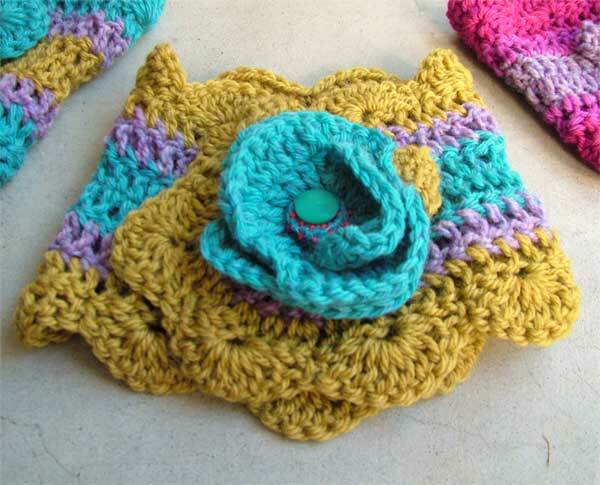 It is made super soft with a bunch of autumn crochet flowers to warmly brighten up anyone's mood. 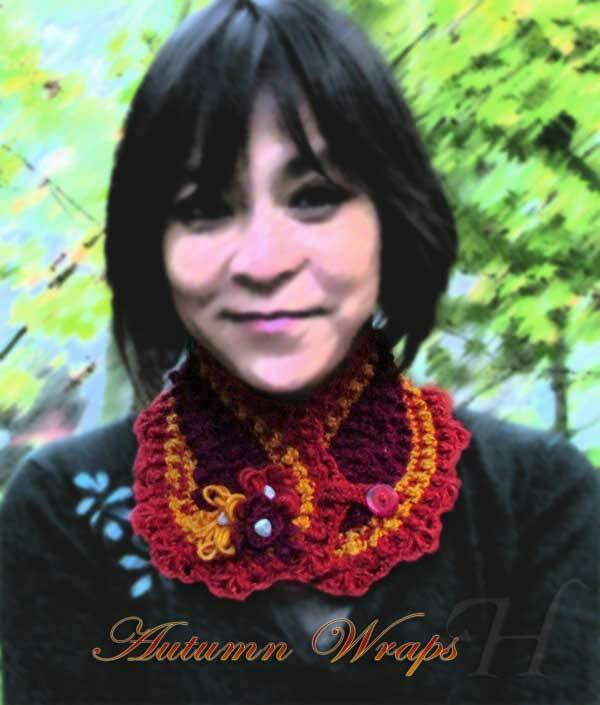 Each flower is crocheted separately, sewn on with buttons and then sewn on to the neck wrap. Finish the loop and button (for fastening) first before placement of the flowers. 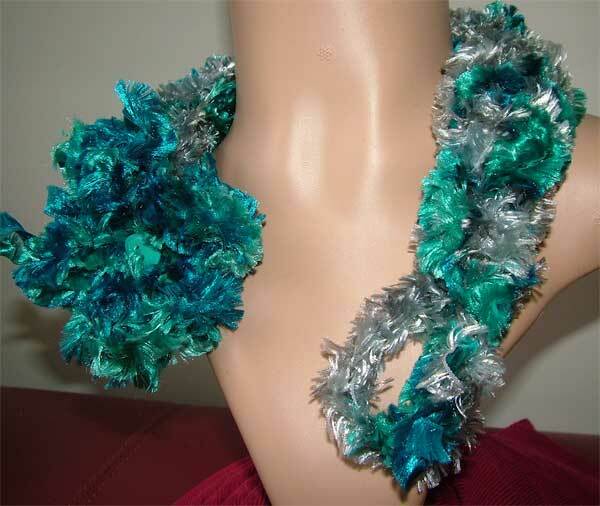 Then wear (on your yourself, someone else, or mannequin) so that the placement of the flowers is easier. It is surprising how, without trying on, where you think the flowers should go, turns out quite visually jarring when the article is actually worn. I just love viscose. Viscose is a mad-made yet natural yarn (made from pulp and cellulose). It has the drape and silkiness of silk and can breathe, just like natural cotton. It possesses the delicious sheen and silken drape of silk. 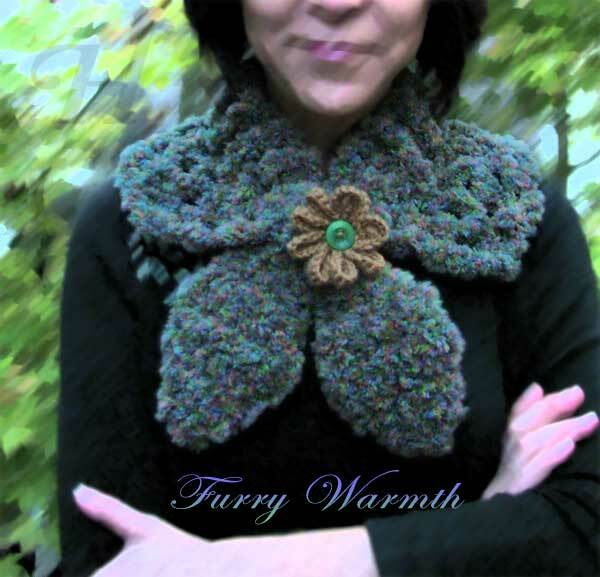 This neck wrap (neck warmer) is perfect for perfect for when you just want that extra touch of soft furriness to make you cozy. 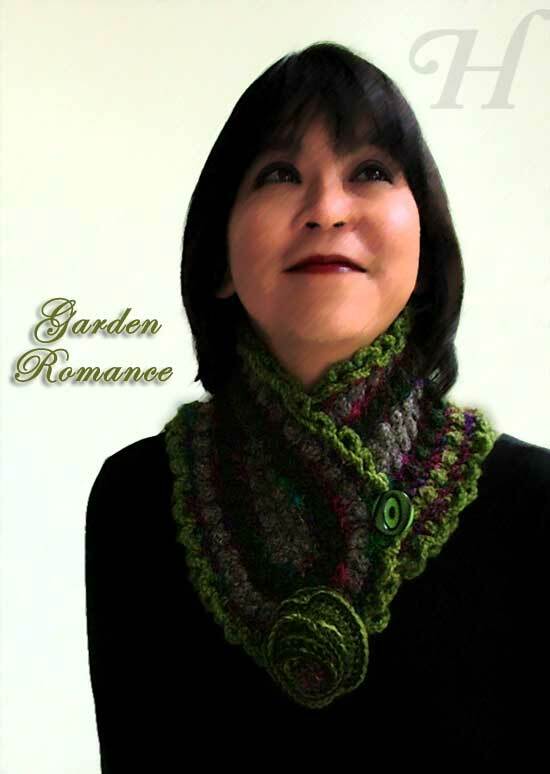 This handmade neck wrap (neck warmer) is made deliciously warm with a combination of pure wool and crocheted lines of silk. 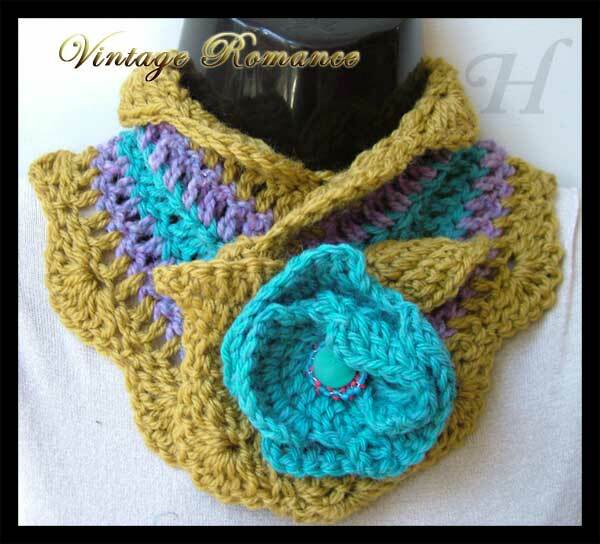 It buttons up on the side, and romanticized with a handmade crochet flower. 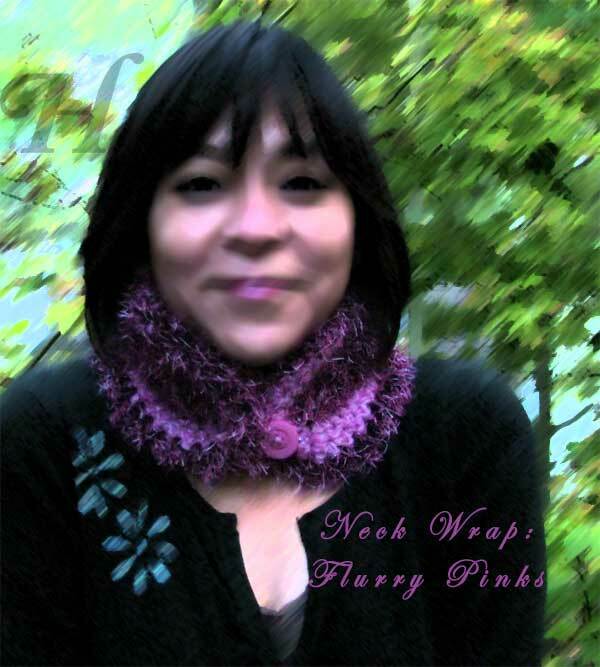 The neck wrap can be worn as a full wrap or turn down the top edges to create a snuggly collar look. Little frills all round the edges add just that needed touch. 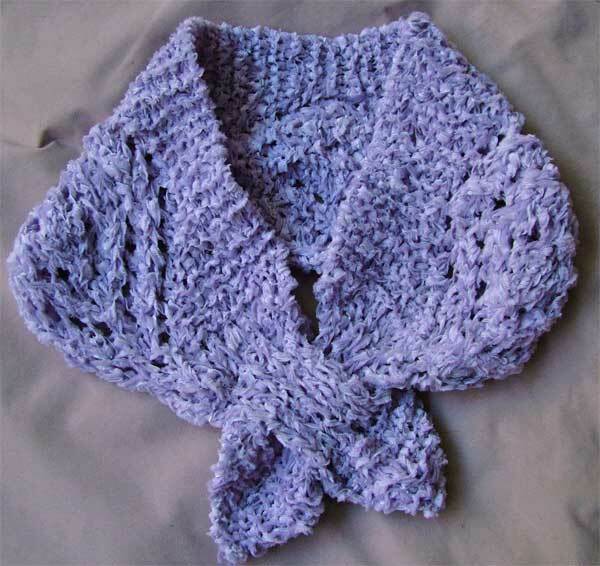 This handmade neck wrap (neck warmer) embodies a vintage and romantic look and feel in soft wool. Here the button is hidden beneath with one end with loop and the other end with a matching button. 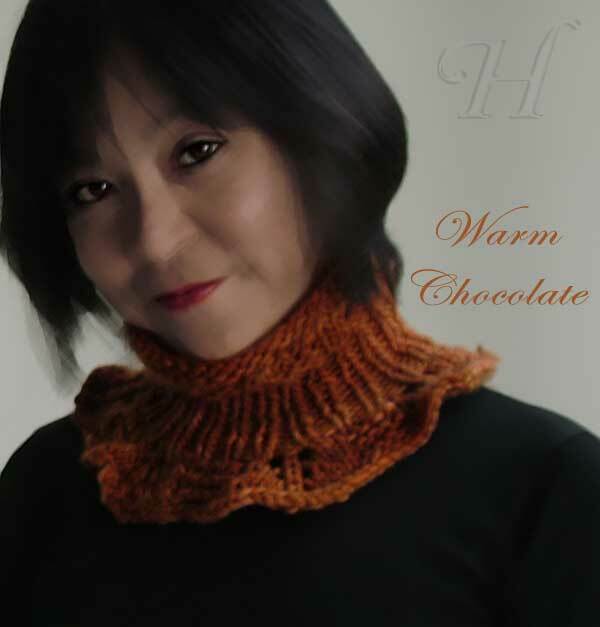 Neck warmers are extremely easy to wear - just wrap around the neck and button up! 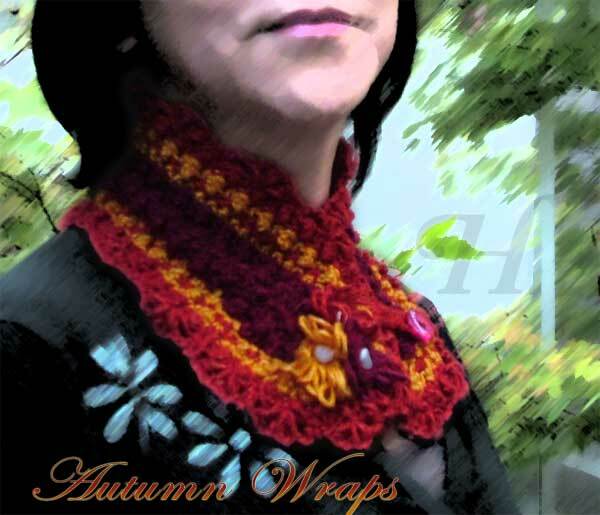 The neck wrap can be worn as a full wrap or turn down the top edges to create a snuggly collar look. The scallop edging gives this piece the romantic, feminine touch.